Unwind is a novel that made waves in the book blogging community when it first released and has continued to do so even now, with the release date of its sequel looming ahead. Thus, I was sure I would love like this novel and while I certainly did immensely enjoy it, I do believe I am the most surprised out of anyone to find that this book - for all its brilliant concepts - failed to "wow" me in its execution or ultimate message, which I believe to be its downfall. I find it difficult to summarize Unwind in just a few phrases, but long story short, this is a dystopian novel in which the issue of abortion has been solved by a new concept called unwinding. In this world, children between the ages of 13-18 can be unwound and their body parts used for medical purposes, thus, these children are not believed to actually be dead as some part of their body lives on in someone else. Unwind revolves around the stories of Connor, whose parents signed him up to be unwound after he got into one too many school fights; Risa, who is an orphan; and Lev who is a tithe and has been preparing to be unwound every since he was born. When Connor runs away to escape being unwound, planning to stay in hiding until he is 18 and a free man from the law, his life becomes inexplicably interwoven with that of Risa and Lev and the three must struggle to escape authorities or face - not death - but unwinding. In all honesty, Unwind had a LOT to like. For one, I loved the concept and the pacing is phenomenal, making you flip the pages frantically and switch from Connor, Lev, Risa, and a couple of other perspectives as well. I think a lot of people have difficulty grasping the reality of this concept and while I agree that a war over abortion is a little far-fetched, overall I thought this was handled extremely well. If fathers in the Middle East can sacrifice their daughters to polygamous and cruel marriages, then surely parents are certainly able to sign up their children to be unwound - after all, they're not REALLY dead, are they? So you see, I loved this idea and found it to be so psychologically intriguing. Connor and Risa's perspectives were certainly interesting, but seeing what a tithe like Lev had to say after essentially being brain-washed his entire life or meeting characters who had a part of someone else's brain in their mind was all very imaginative and interesting and I loved it. Yet, for all my praise of this novel and its writing and its psychologically scarring elements - because there is one gruesome scene that may throw off other readers - what really brought down this novel was its ultimate message. Every author has a point they're trying to make in their work and from the surface, the point of Unwind is quite obvious as a rebellion against this cruel and unnatural mode of living slowly begins. Yet, there were so many discrepancies that made me sit back and think after finishing this book and while I loved reading it, I don't think it's a book that deserves all the praise it receives. Yes it's a new and original idea, yes the writing is great, yes the characters are well-developed, but let's look at what this story ultimately says. Note: Yes, there are spoilers ahead, but they will not ruin the story for you. In fact, if you haven’t read this novel, they will most likely not make much sense, so you can read them without any harm, but if you don’t wish to read them, skip below to wear the semi-spoilers end. First of all, Connor receives an arm from an unwound at the end of this novel which seems to take away the entire purpose of it. You see, Connor is running away from being unwound only to receive a part of that procedure because he's in trouble which is a huge irony and red flag for the ultimate message. I think the saddest thing though, is that this unwound arm he receives was only a part of the tale to further the romance, which isn't even that great to begin with. It's disturbing and bothered me immensely. Next: Lev. I loved Lev because of the conflicting emotions he went through as a tithe, but ultimately, he never realized the value of life and living. For a tithe, being an unwound means doing a great service and once Lev understood the horror he was about to face, instead of embracing life, he became a human bomb to destroy an unwinding hospital facility. Okay, this is good...right? Yes, he's destroying these horrible facilities, but at the cost of his own life because he still does not see that being alive is better than being unwound or dead and it is his near-death and not near-unwinding experience which enables him to see the light which, again, contradicts the true message of this novel! One last example: the Admiral. The Admiral unwound his son but wanted to stop it from happening at the last minute, but since he couldn't, he spent the rest of his life finding out where the parts of his son had gone and gathering them together. (Not the parts, the people who had the parts). On the surface, this seems very sweet since he’s just trying to be with his son again, but really, it isn’t sweet at all! 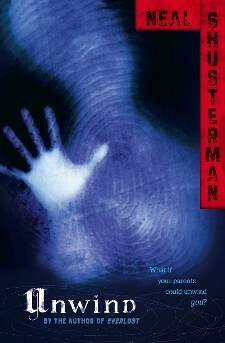 What Shusterman essentially does is show us that yes, Unwinds are alive because even if their body parts are not all put together, by assembling a group of people who contain the same body parts as one person, that makes the person whole and alive once again. The Admiral was essentially speaking to his son's brain and seeing his son's lungs of asthma and hearing his son's voice so how was he not alive? The point of this novel was to show that there are things worse than death, such as unwinding and ceasing to be yourself, but then the author went and proved that unwinding really wasn't that bad after all! I think what Shusterman meant to do was something much different with this scene, but its execution and the way it is ultimately interpreted fails to really add to the message he’s building up with his story. I liked this book - I really did. It was such an original and creative take on a very pressing and modern issue, but there were way too many plot holes in it. Some of the rebellion mobs made no sense and many of the secondary characters were vastly underdeveloped too. I would still recommend this as most people seem to have overlooked or skipped the plot holes, but I simply cannot. I still don't know what this author planned to achieve with this book, only because so much of it was contradictory, but hopefully the sequel will be better! Ooh, this definitely sounds intriguing and your review has me very curious, especially about the gruesome part (I'm wondering if it would be too much for me.) I haven't read much about this, maybe only one other review, but I can see why it's a bit controversial, I might just have to give this a go! Nooo this was my worst read ever! I hated it with every fiber of my being. But I won't judge you... much. Bahah just kidding. Great review, though! :) I haven't read this so I was pretty confused reading about the plot wholes, but i enjoyed reading your review. Its nice to hear your opinion on this story. Fantastic review! Wonderful points. Aww, I'm sorry that you didn't love this much as most people did Keertana!! I actually did end up loving it, but I can understand why you didn't. The pacing is really wonderful in this book, and I loved the messages, but I do understand why you think some parts are ironic. The romance wasn't one of my favorite parts of this book, but I did love both Risa and Connor. And Lev becomes really wonderful in the second book, so I hope you end up picking up the sequel! I love your analysis of this book! I am not a huge fan of the book - I am definitely one of those readers who mentioned who was thrown off by that one gruesome scene. I still feel all grossed out thinking about it now, months after I finished reading that book. Unwind is one of those books that just didn't fit with me, so it's nice to have someone who also wasn't a huge fan of it. In terms of your points, I completely understand the direction you are taking in your anaylsis. I will say that from my own interpretation of the book, I thought that Connor's new arm was kind of creepy and disturbing but didn't necessarily go against all the messages presented by Shusterman. I agree 100% of the irony in Connor receiving that arm. But I think it's supposed to be ironic, kind of showing how convulted and messed up everything has become. And there's the fact of whose arm that is...which I'm sure is another major thing. I think there's definitely a message about how no easy solutions can be made, and how the problem has become so ingrained in so many aspects of the society. And maybe their rebellion will eventually force changes to occur, but there are still all of these unintended and unwanted consequences that the characters can't will out of existence. As for Lev, it is weird and seemingly out-of-character for him to decide to kill himself in emancipation of his own life. But, at the same time, at least he's actively deciding what he wants to do with his life and how he'd rather die, given the chance. As for the Admiral, I think that once again Schusterman is showing how the situation is not so cut and dry. But I didn't interpret echoes of his son's life through body parts as his son actually being alive again. I think that the concept of unwinding IS intriguing, and even though I often shy away from perspective-jumping books, this one seems fast paced and gripping enough to to be a bother.